As promised this post is really a part II to last weeks entry where I introduced a monthly series titled "Room of the Month", if you're a new reader I recommend you checking out this post before moving on! But if you're up to date and ready to learn more about Entryways... WELCOME BACK! In my humble opinion entryways are a part of the house that should not to be overlooked in the styling and functionality of your home. To most it's the first thing you see after a long days work and it sets the tone of your home to guests. It's one of those spaces that require a few key pieces that without can lead to many moments of frustration! Now I'm aware not all homes have a formal entryway but with smart placement of furniture anyone can give off the illusion of having a separate entryway. 1. Console Table- this offers you a surface to place your things as soon as your walk in the door. Where does the mail go everyday, to your kitchen counter? NO! What about your sunglasses- who knows how many pairs you've lost over the years! If you're a mature adult you have important things that deserve a safe and proper home. 2. Seating- another functional piece of furniture this space needs. Give yourself and your guests a place to sit while you put your shoes on. How awkward do we all feel trying to do just that while simultaneously continuing our goodbyes and avoiding blinding your host with your rear end high in the sky? It's just not a good look. 3. Rug- a rug adds some texture and softness to your entry and provides floor protection from harsh outside elements. If you're from an area where is snows you know how unfortunate it is after coming inside, taking off those snow covered boots and immediately experiencing the horror of a wet sock! An area rug will soak up some of that water, it's up to you to avoid the puddles. 4. Lighting- I'm sure we're all familiar with that dreadful time of year when we leave for work before the sun comes up and return home after it has gone down. Personally, I think that should be illegal for our sanity. But until that happens go ahead and get yourself a light timer (no, I'm not 80 years old) it will just do wonders to the feel of you home when you're not coming into a dark house every night. 5. Mirror- A mirror will not only help illuminate any natural light the space has, but right before you walk out the door everyday you should take one last look yourself and say "You are beautiful, you are smart, and gosh darnit, people like you!!" 6. Tray or Catch All- This my friends is what I'm talking about when it comes to saving time and frustration. Do yourself a favor and find a tray or a small dish of some sort to place on your console table. Keys, sunglasses, wallet, metro cards- all the super duper important tiny itty bitty things can be stored on your tray to make the next exit that much smoother. Not to mention all that "stuff" will look much less like clutter and like a more intentional styling move on your part. You're Welcome! 7. Storage- It could be a built in closet, drawers that are part of your console table or a stand alone basket; but you need someplace to hide away all the unsightly things. Everyone does it differently depending on the layout of the rest of your house, but maybe that's where you have a mail/bill organizer, or you store cold weather items like hats, gloves and scarves in a basket. However you stay organized it's up to you, but keep it contained! 8. Art- 100% decoration but should not be overlooked, this is where you get to show off your personality a little. Remember when I said the entryway sets the tone for your home, this is the first space guests see so give them a little teaser of what's to come throughout the rest of your home! 9. 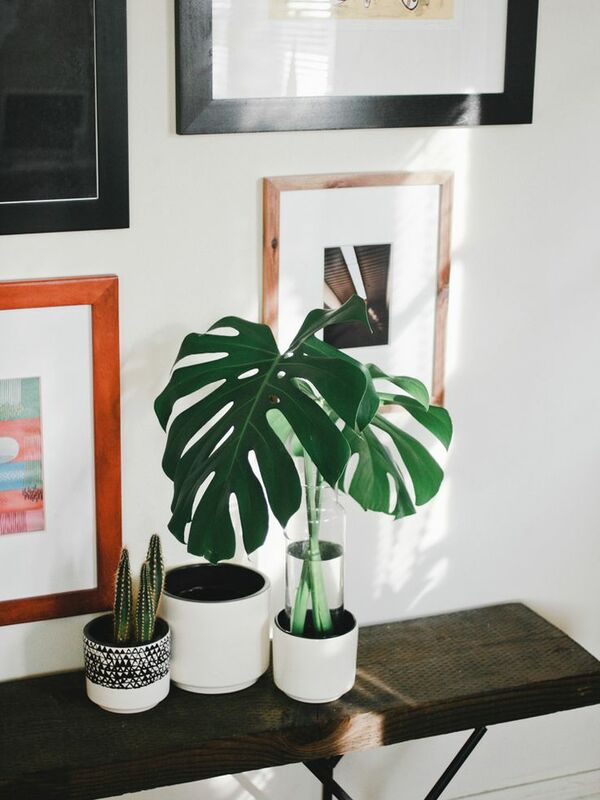 Plant- I'll be the first to admit I have no green thumb, that's why I suggest using an air plant or succulent, but adding a plant will give you a tiny splash of color and bring a little life to this space. 10. Candle- Again, more for styling purposes but if your having friends over let them be greeted by your favorite scent. I know there's some study out there that links the relationship between smells and memories- make it a positive one! There you have it- 10 simple items to build yourself a beautiful and functional entryway! Most likely you already have at least half of these items in your home. It's all about reusing, repurposing and letting go of the idea that just because something has lived on a certain shelf since you bought it doesn't mean it has to stay there forever. It's your home so play around with different configurations to see what works best for you!